The petition has been launched by Ronald Mitchell and comes following 700,000 people protesting in central London and demanding a “People’s Vote”. The petition, which at the time of writing has been signed by 94,345 people, said: “Although not legally binding the referendum on whether we stay of leave the EU carried out on the 23rd June 2016 was the clearest indicator of the will of the electorate. “At that time our Prime Minister David Cameron assured us that the result of the referendum would be carried out. Once the petition is signed by 100,000 people, it will be considered for debate in Parliament. Mrs May has also ruled out another general election following speculation on the issue. The question of another general election has been raised recently as it has become clear Mrs May will find it difficult to pass any Brexit deal through the House of Commons. The prime minister lacks a majority in the House of Commons so a Brexit deal could be voted down. 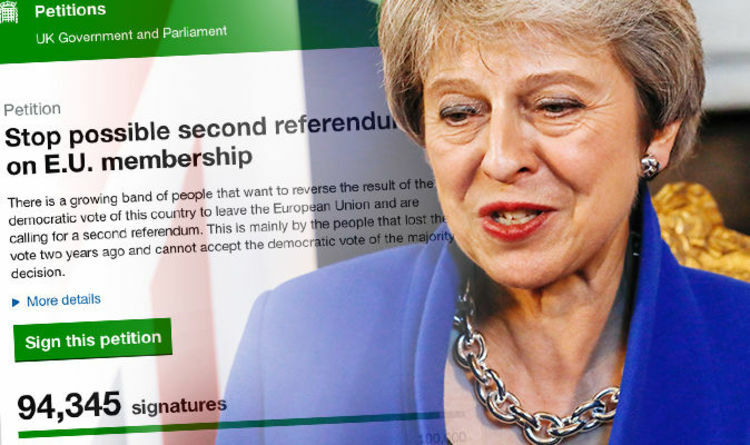 A cross-party group of MPs plan to force a second referendum by plotting various amendment to May’s Brexit deal so it does not get through. Tory MP Sarah Wollaston, Tory Phillip Lee, Labour’s Paul Williams and the SNP’S Philippa Whitford are behind the plan. Independent MEP for North East England Jonathan Arnott said: “The people voted in the 2014 European elections, the 2015 General Election, the 2016 referendum, and the 2017 General Election. “We don’t need a fifth vote, people don’t want one, and there isn’t time for one. “We’re five months from Brexit, yet Electoral Commission rules require a six-month campaign period for any referendum. “The EU won’t agree to extend Article 50 because it would mess up the European Elections across the whole EU next year. “The whole idea of another referendum is illogical, destabilising and doomed to failure.